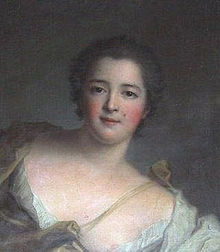 Marie Anne was first known as Mademoiselle de Monchy, then as the Marquise de la Tournelle, and finally, and most famously, as the Duchesse de Châteauroux. She was definitely the most famous of the sisters - the only real attempt at a serious biography, written by the Goncourt brothers in the late 19th century, was entitled: The Duchess of Châteauroux and her Sisters, the other girls taking a definite back seat to their more famous sibling. Here she is painted by Nattier. I was privileged to see this portrait in the flesh - it's hanging in her apartments at Versailles (rooms which later became the apartments of Madame de Pompadour, the protagonist of The Rivals of Versailles). I was not expecting to see her, and then suddenly, there she was! It was quite amazing to feel that connection: this was a painting that she sat for, and that later she would have looked at and admired, possibly even touched. The painting is actually very stunning and luminous; the internet really doesn't capture how lovely it is. The date on this painting is sometimes given as 1740 - which might mean it was painted before she became the mistress of the King. This picture on the right is sometimes said to be of Marie Anne. It's also by Nattier and she represents Thalia, the Muse of Comedy. I love this portrait - the way she is peeking out from under that gorgeous blue green cape - but it might not be Marie Anne. It dates from 1739, so it would have been painted when she was still the Marquise de la Tournelle. Of course, as a high aristocrat she still would have had her portrait painted by the leading painters of the day, so it still might be her. I hope it is! Here is another supposed portrait of Marie Anne, entitled "La Force, a personification of Fortitude (Marie-Anne de Mailly-Nesle, Duchesse de Châteauroux?). 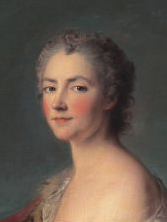 It's by Nattier and dates from 1743 when she was at the height of her powers. I love the idea that Marie Anne posed as Strength! Very fitting. Notice also the same colors and leopard skin cloak as in Louise's portrait here. This print on the right, simply entitled La Duchesse de Chateaurox, intrigues me. It's a 19th century print (1863) but it would have been copied off an existing portrait that was known at the time to be Marie Anne. I bought this print, and now I'll keep my eyes out for an "Unknown Woman" painting from the 18th century that resembles this one! Writing Marie Anne was really fun; in some ways she's got the confidence and blithe spirit of Pauline, but she's also more subtle and crafty. There is no doubt that the King loved her to abandon - who knows what history would have been had it not ended the way it did? It would be hard to imagine a world without Madame de Pompadour, Marie Anne's successor and the main protagonist of The Rivals of Versailles.